Letchworth State Park is a New York state park located 35 miles (56 km) southwest of Rochester and 60 miles (95 km) southeast of Buffalo in Livingston (towns of Leicester, Mount Morris, and Portage) and Wyoming (towns of Castile and Genesee Falls) counties. The park is roughly 17 miles (24 km) long, covering 14,350 acres (58 km2) of land along the Genesee River. 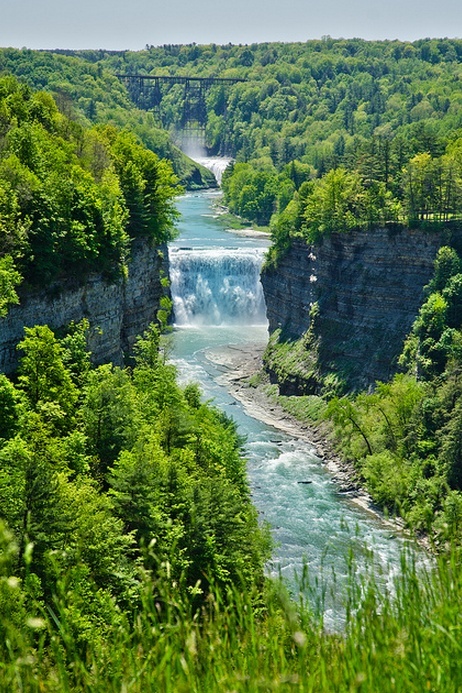 Within the park, there are three large waterfalls on the Genesee River and as many as fifty waterfalls found on tributaries that flow into it; the gorge formed by the river, with rock walls rising up to 550 feet (170 m) in places and which narrow to 400 feet (120 m) across above the middle of the three falls, prompted the area's reputation as the "Grand Canyon of the East".